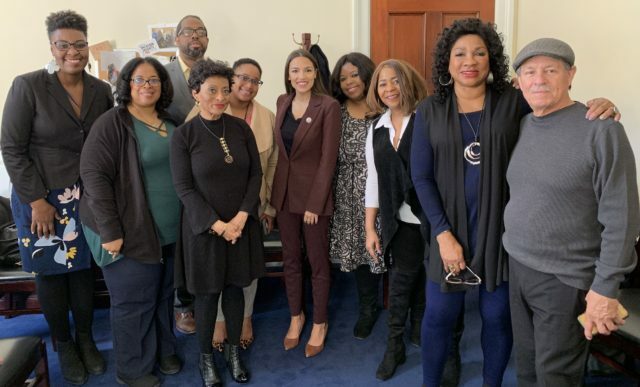 On February 26-27, 2019, WE ACT and fellow environmental justice champions from around the country visited Washington, D.C. to elevate our concerns about the myriad of environmental and health issues disproportionately affecting low-income communities and communities of color. In particular, we wanted the elected officials shaping the Green New Deal to not only understand our concerns with the current resolution but also to build relationships so that they can work with us – and the communities we represent – to ensure that it emerges as a just and equitable Green New Deal for all. Peggy Shepard, WE ACT’s Co-Founder and Executive Director, begin the day by testifying before the U.S. House of Representatives Committee on Appropriations’ Subcommittee on Interior, Environment, and Related Agencies. 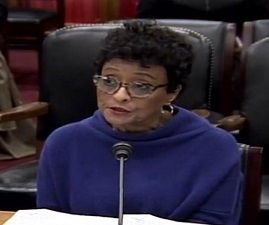 The purpose of the hearing was to learn first-hand about environmental issues, concerns, and needs from experts in the field to help develop the budgets for the EPA and other agencies. Peggy covered a variety of issues, including the necessity of studying cumulative impacts, and citing examples from Harlem to Alaska and Flint to Houston. You can watch her full testimony on C-Span. 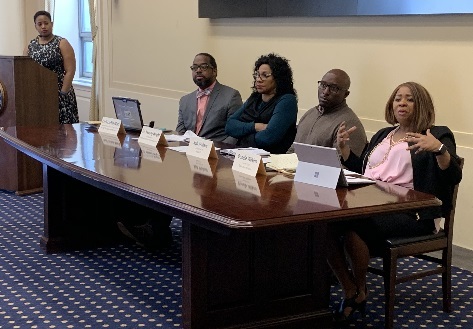 Immediately after, we co-hosted a panel discussion on the Inclusive Renewable Energy Economy Powered By Green Jobs in partnership with the Congressional Black Caucus. Moderated by WE ACT’s Director of Legislative Affairs Kerene N. Tayloe, Esq., participants included Congressman A Donald McEachin (D-VA), WE ACT’s Deputy Director & Director of Policy Initiatives Cecil Corbin-Mark, Deep South Center for Environmental Justice’s Founding Director Dr. Beverly Wright, Power 52 Co-Founder & CEO Rob Wallace, and Green Door Initiative President & CEO Donele Wilkins. The panel was mentioned in Bloomberg, broadcast live on Facebook, and received a good write-up in E&E News (PDF). And you can now watch the video on YouTube. We were then joined by environmental justice leaders from around the country, including Dr. Beverly Wright, Founding Director of the Deep South Center for Environmental Justice; Donele Wilkins, President & CEO of the Green Door Initiative; Juan Parras, Founder & Executive Director of Texas Environmental Justice Advocacy Services (t.e.j.a.s. ); LaTricea D. Adams, Founder, CEO, & President of Black Millennials For Flint; and Mustafa Santiago Ali, Vice President of the National Wildlife Federation. 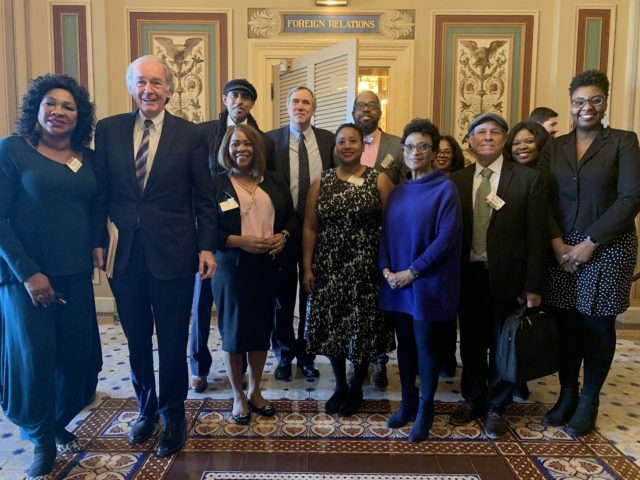 This group, along with WE ACT’s Peggy Shepard and Cecil Corbin-Mark, testified before Senator Ed Markey (D-MA) and Senator Jeff Merkley (D-OR) of the Senate Climate Action Task Force at the U.S. Capitol. We provided an overview of environmental justice concerns and then discussed the Green New Deal and how to ensure that it is a just and equitable one. The closed-door hearing was attended by several congressional staffers, including some we would meet with later that day. That afternoon, we met briefly with Senator Bernie Sanders (I-ME). We then met with the staff of Senator Kamala Harris (D-CA) followed by the staff of Senator Cory Booker (D-NJ). During these meetings, we discussed how to ensure an equitable lens for the Green New Deal. In the latter two instances, we agreed to conduct follow-up discussions and meetings. The following morning, we met with Congresswoman Alexandria Ocasio-Cortez (D-NY) and her staff, along with the leaders of the Sunrise Movement and the New Consensus. Again, we discussed our concerns with the current Green New Deal resolution and opened the door for further discussions on how to improve it. In summary, we built some bridges – and strengthened existing ones – to people in power to ensure that the needs and concerns of our community – and others like it around the country – are heard, understood, and taken into consideration on Capitol Hill. Thanks to the hard work of our Federal Policy office in DC – namely WE ACT’s Director of Legislative Affairs Kerene N. Tayloe, Esq. and Communications Manager Dana Johnson – it was a very productive day-and-a-half, including meetings with the two architects of the Green New Deal and the staff of three presidential candidates. We are already working on follow-up meetings and plan to continue developing these relationships.